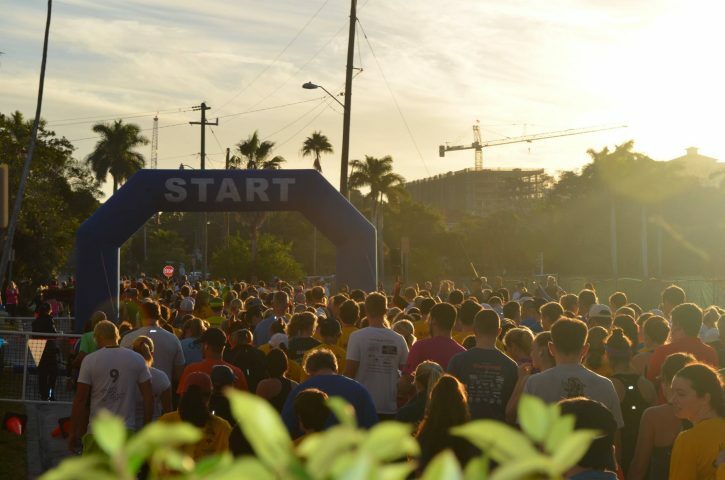 Participants line up at the start of this 5k race at 7:30 a.m.
Nov. 22, 2018 marks the 9th annual Turkey Trot in Sarasota. The 5K race is part of ALSO Youth’s programming, a nonprofit that supports the young LGBTQIA+ community in Sarasota. The event took place at 7:30 a.m., starting at the Hyatt Regency in downtown Sarasota. Runners received a free t-shirt at the end of the race and winners were divided into categories of age and gender. Along with the money raised from the race, ALSO received $28,000 in donations from their 24-hour Giving Challenge. ALSO Youth has provided education, advocacy and support for LGBTQIA+ youth, ages 13-21, in Sarasota since 1992. The funds raised allow them to maintain their space and increase educational outreach to the community. Besides participating in their annual Turkey Trot, there are many ways to get involved with ALSO Youth. Community members can work with youth, join a committee, help with office work, host a fundraiser or help by purchasing items off of ALSO’s Amazon wishlist. Race results can be found on ALSO Youth’s website. To get involved, contact info@alsoyouth.org. ALSO Youth is located at 1470 Blvd. of the Arts, Sarasota. Information for this article was gathered from alsoyouth.org and active.com.